GSMArena team, 23 July 2013. The gallery on the S4 zoom is the standard TouchWiz Gallery, which is very capable. It has several view modes - Albums (the basic one), but also Time, Locations, People and Favorites, which help you sort through your photos. The size of the thumbnails can be adjusted with a pinch zoom or with the lens ring. The lens ring can also be used to zoom in on photos. You can swipe right to reveal a pane with all the folders, which helps navigate multiple folders with photos (you can pick multiple photos from multiple folders at once). One option advanced photographers will appreciate is the picture details popup, which shows things like focal length, ISO, aperture, shutter speed and so on. Gallery will automatically pull photos from your Picasa account (now folded into Google+). The app also offers two ways to annotate your photos. One turns the photo into a virtual Polaroid and lets you write a note on the empty space. The other is non-destructive and saves the scribbled label away from the photo, but those are harder to share. Story Album can be really helpful in organizing your photos. After a shooting session it will prompt you to group all the new photos into an album. Albums can be created based on location, the people in the photo and when the shot was taken. The Samsung Galaxy S4 zoom also includes Photo Suggest, which gives you a peek at the most popular locations and sights people have photographed either near you or in places you plan on visiting. This way you can plan ahead what to see and photograph. The Gallery app offers a fairly capable image editor. It covers the basic operations like crop and rotate, adjust image properties (from Auto adjust to manual exposure tweaking), add color effects and frames. A more creative app is the Paper Artist - it applies an effect to the photo and lets you paint only a section of the image to highlight a specific objects. You can also draw freehand and add frames. Editing videos is also enabled and it's a very simple process. You pick a theme (you get only one preinstalled, the rest you can download for free), which puts in a few stock clips for titles and lets you plug in your own videos and photos. The TouchWiz music player on the Galaxy S4 zoom is jam-packed with features and supports a wide variety of file formats, including FLAC (16 bit, not 24 bit), Wave, etc. The Samsung Galaxy S4 zoom can also search for content on third party players like PCs on the same network. Samsung has enabled equalizer presets (including a custom one with 7 bands) along with the sound-enhancing SoundAlive technology, which features 7.1 channel virtualization. Samsung uses SoundAlive in some of their MP3 and Android-powered media players. There's also Smart Volume, which equalizes the volume between tracks. While listening to a song you can find music controls in the notification area and the lockscreen. Voice commands can be used to control the player too. The best video player found on smartphones just got better. The new video player, found on the Samsung Galaxy S4 zoom has the last watched video on top for quick access. Under it there are three tabs - personal (showing you the videos on your local storage), Download (which lets into the Videos store) and Nearby devices, which shows the PCs and players on your local Wi-Fi network. The Samsung Galaxy S4 zoom offered a list of subtitles and let us pick. It scans for all subtitles, so the file doesn't have to have the same name as the video file. The Galaxy S4 zoom managed to play all files we threw at it. DivX and XviD along with MP4, AVI and MKV were no problem for the Galaxy S4 Active, though DTS and AC3 audio failed play. Despite the different chipset, the Samsung Galaxy S4 zoom didn't disappoint and matched the perfectly clean audio output of the rest of the Galaxy S4 family. The Samsung Galaxy S4 zoom had absolutely flawless output when connected to an active external amplifier, producing excellent scores all over the field. Its volume levels aren't the highest we have seen, but it should just fine for most users. 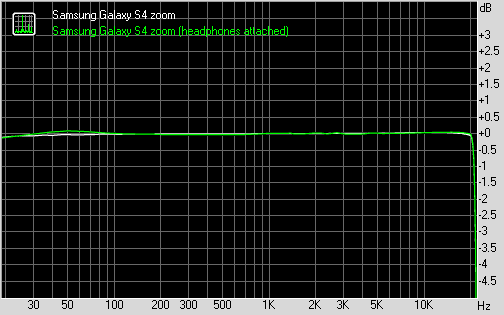 Impressively enough, there's next to no degradation when you plug in a pair of headphones. Save for the barely detectable (in the lab, let alone with a naked ear) hike in stereo crosstalk the output remains perfect. A really solid showing by the hybrid device here.